Just been looking at the amazing machines that Three Wheeler owners have or used to have. 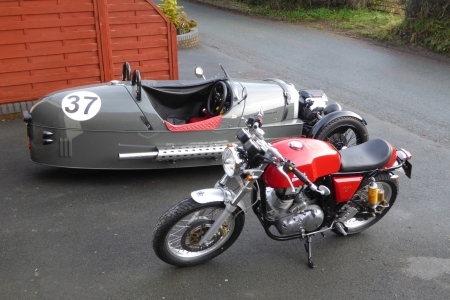 Can't for the life of me work out how to post an image in the Three Wheeler forum so have posted a couple of pictures of my little Cafe Racer here. Royal Enfield,2016,535cc Continental GT. Built in India but the frame and styling designed by Harris in the UK. I love the RE. I would be tempted but I don't think my reactions are now good enough for biking today. Also the beer gut will get in the way. That's one reason I like the Trail version John - sit more upright, less chance of wearing out the paint on the rear of the tank! Try something with 18" risers!